Everyday until the end of this month you can expect to some great tutorials made by you, my readers! I am so excited about this series and I have so many talented guest bloggers. I hope you enjoy them all! I am drooling just looking at these pictures. Yum, yum! 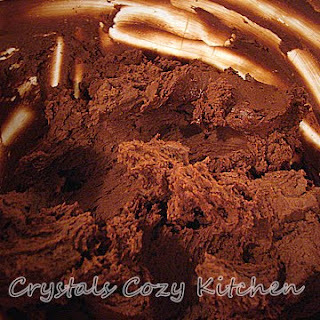 Hi, I’m Crystal behind Crystal’s Cozy Kitchen the site where YOU tell me what recipe I post every week. My love for cooking started out very young. I would read my mom’s cookbooks (or just look at pictures) and incidentally destroyed at least one. I believe in the Family Table. Each week I post my dinner recipes for the previous week and let you vote for which recipe I will be posting. I believe good food is an important part of dinnertime spent together. My meals are not elaborate, but I try to make them flavorful, healthy and inexpensive. Two years ago I made home made chocolates for the first time and they are so heavenly! I was inspired to do so because our friends gave us a box of chocolates made by a chocolatier. For a box of 12 it cost around $30. Of course for most of us that is only a rare treat due to cost, however making them at home is so much more cost effective! They do take a little bit of work, but so do sugar cookies if you think about it… However you’d be more likely to give away sugar cookies than these chocolates. They are that delicious. Of course it does matter what type of ingredients you use. I used Guittard chocolate chips, mainly because they have 63% cacao chips, and because the chips were cheaper by ounce than the bars of chocolate. I am also currently in a rural area so there is not a huge selection of chocolate available. 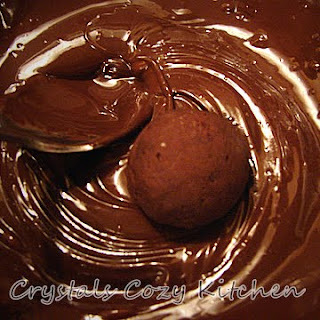 When making these chocolates, I would use dark chocolate such as 60-70% cacao. You can use semisweet, but use a little less honey. I tried using milk chocolate around Christmas, and it works, but they were too sweet for me – however Hubby loved them (he is a milk chocolate lover and I’m a dark chocolate lover, I have not converted him to dark yet.) 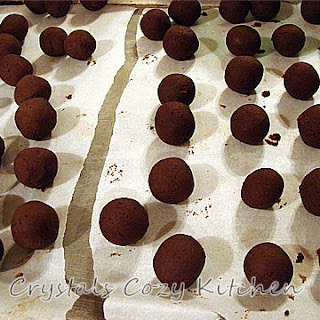 If you do use milk chocolate you will need to freeze them in order to shape them into balls and coat them with the melted chocolate. 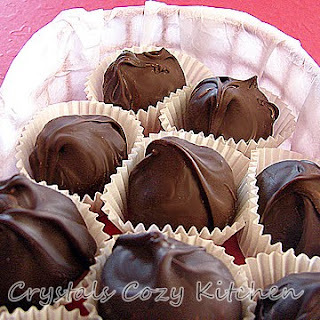 Freezing is optional with the darker chocolates but does help to get a thicker coating. 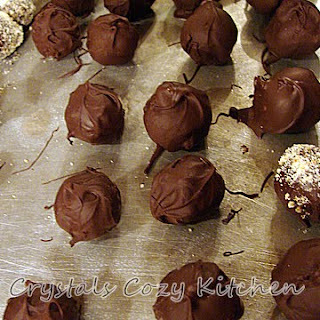 In the tutorial I show how to make Honey Truffles, however there are some other flavor combinations that I have at the end. All are delicious ;). You can easily double or triple this recipe as well. I wouldn’t suggest making less than this recipe makes as the work is not worth the small yield. I would however suggest doubling it without any hesitation! 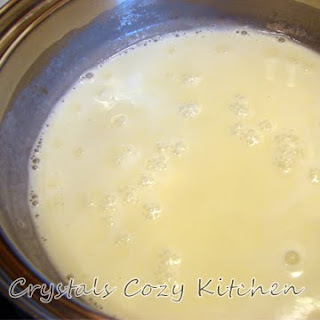 Stir often over low heat (if you have gas heat low works but most electric units turn off when they reach a certain temperature so you may need to increase the temperature to bring to a boil) until cream mixture boils and becomes bubbly. 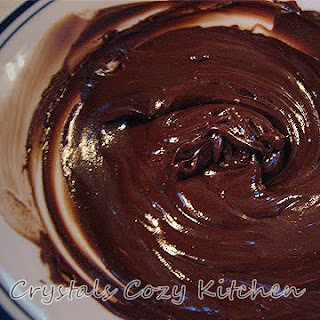 Let chocolate and cream mixture sit for 5 minutes to let the chocolate melt. Do not stir during this time. 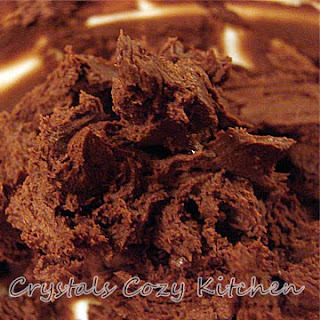 To help the chocolate melt you may need to place the bowl of chocolate and cream into a hot water bath (making sure not to get water in the chocolate.) I have made these using both plastic bowls and metal bowls. The plastic bowl melts the chocolates better without the hot water bath but the metal bowl helps the chocolate chill faster. Once the 5 minutes is over, stir until velvety smooth. Place chocolate into the fridge and let sit for 15 minutes. Remove from refrigerator and stir. Refrigerate for another 15 minutes. Remove chocolate from fridge and stir again. It will be starting to get more stiff and harder to stir. Refrigerate for another 15 minutes. Remove from fridge and stir, it should be stiff by now. At this point I used a hand beater. I have used a fork to stir at this stage before, but the hand beater works better and I think makes the chocolate more smooth once completed. 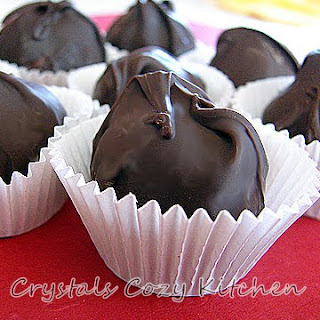 I have also used my new kitchen aid to make these and it works the best by far! You don’t have to worry about over-beating these if you beat for 1-2 minutes each time. Place back in the refrigerator, but only for 5 minutes this time. Remove and stir again. Place for another 5 minutes in the fridge. Remove and stir. Congratulate yourself, you’re finished with the mixing! Place chocolate in the fridge for 10-15 minutes more. 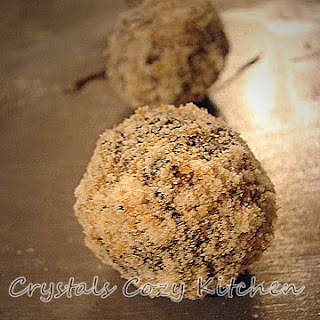 Remove chocolate from fridge and form into rough balls. 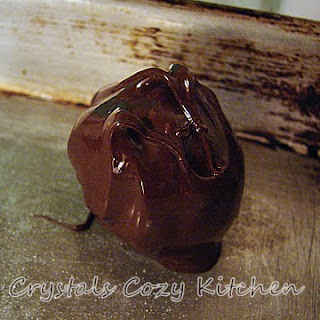 I use about 1/2 Tbsp to 2 tsp ganache per ball. Refrigerate for 10-15 more minutes and shape into balls. 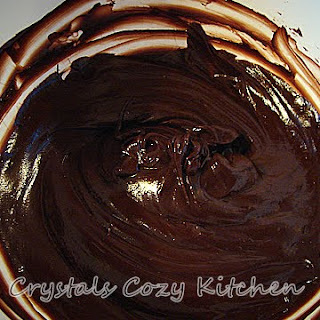 Place ganache into the freezer for about 10-20 minutes. 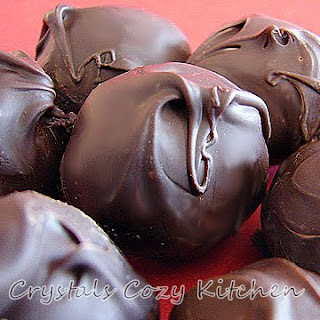 You can refrigerate them for 15-20 minutes instead of freezing them, but I find that freezing the ganache balls makes it so they get a thicker chocolate shell and it helps them set faster. 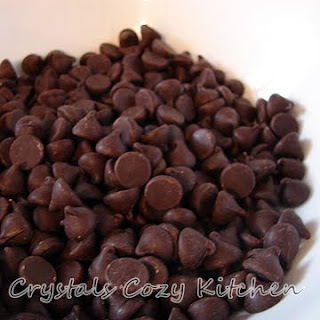 Melt 1 cup chocolate chips (or chopped chocolate) in the microwave (or a double broiler if you prefer – just be sure no water touches the chocolate). To melt in microwave, microwave on high for 30 seconds, stir, microwave for 30 seconds more, stir. Continue with 30 second increments until all pieces are melted, but make sure it does not get too hot to handle. You will be hand dipping chocolate and do not want to burn yourself. 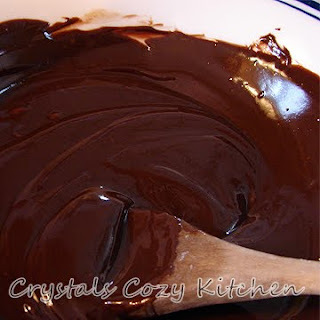 You also do not want the ganache to melt into the melted chocolate. 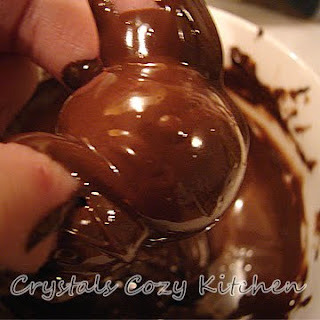 Place a ganache ball into the melted chocolate. Roll around in chocolate, be sure to coat all of it. 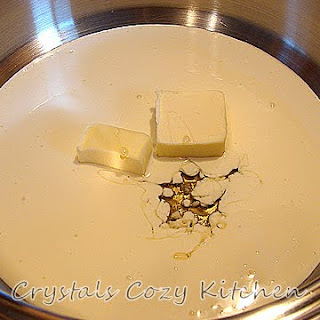 Place on a greased cookie sheet or on waxed or parchment paper. I like using parchment paper because it is easier to write on to label the type of chocolates – a bonus if you make several types in one day. Let the chocolate set until the coating is hardened. If you want to put something on the top so you know what the flavor is, you need to do it before it is set. You will need to top them as soon as you coat each one. This one above I completely coated in vanilla wafer crumbs. Delicious. 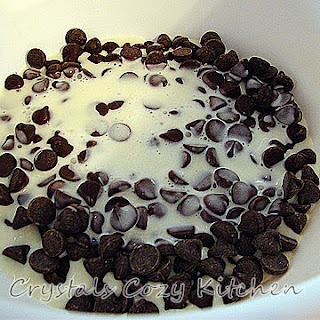 Add 3 Tbsp Cheesecake cream cheese spread (room temperature) to chocolate just after steeping for 5 minutes. 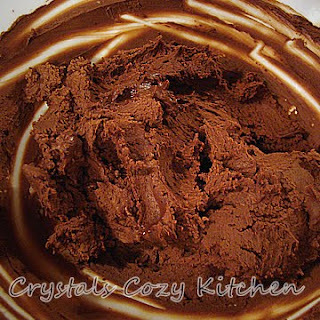 Then once coated in chocolate, roll in finely chopped pecans. Once coated in chocolate, roll in graham cracker crumbs or vanilla wafer crumbs. Replace honey with sugar syrup. Add 1/2 tsp fresh finely grated lemon zest to chocolate before steeping. Once coated in chocolate, place a small strip of lemon peel on top. 1/4 cup Peanut butter (omit butter), 2 Tbsp jam – I used raspberry seedless jam (omit sugar syrup/honey). Add after steeping for 5 minutes. It is easier to mix the PB and J together before adding to the cream. The Jam/Jelly will add in easier if already mixed to the PB. 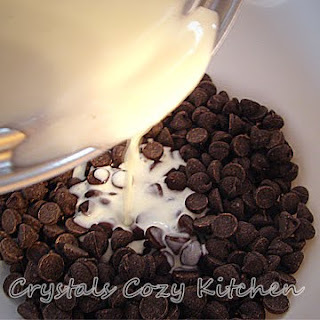 Add 2 tsp cinnamon and 1/4 tsp ground red pepper to the cream. This combination gives a hint of heat as an aftertaste – if you want the heat to be more than a hint add more ground red pepper. 1/4 cup Pumpkin puree reduced to a thick paste (just cook it over low to medium heat stirring frequently), 1/4 tsp cinnamon, 1/8 tsp nutmeg, 1/8 tsp ginger added to the cream before scalding. You can also add the spices to the puree. Great article. In case any of your readers are interested in making all kinds of homemade chocolates, have them check out http://www.making-chocolates.com. 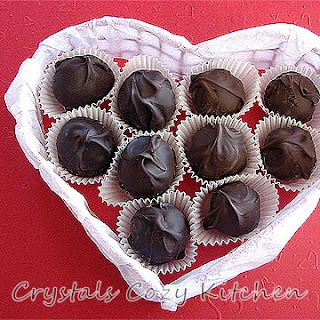 Homemade chocolates make great gifts!